The Grand Canyon has so many sights and colors, and this two day trip gives you time to see them all. From the brilliant red sandstone country of Sedona, to a visit to the Painted Desert and an authentic Navajo Reservation, you'll love every minute. Explore the Grand Canyon on this overnight tour which includes Sedona, the Painted desert and a visit to an authentic trading post on the Navajo Reservation for shopping. 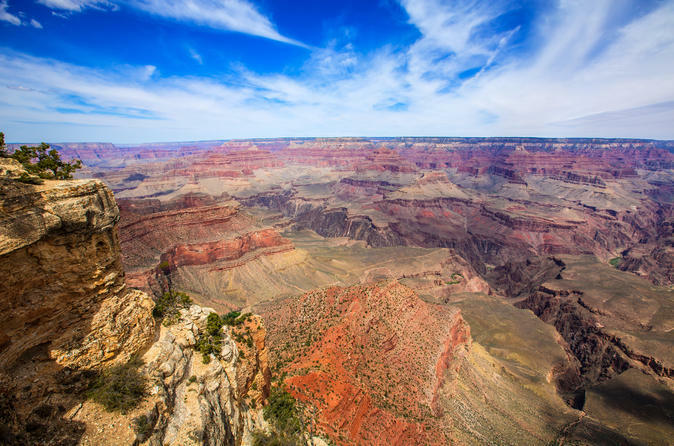 This tour offers a perfect way for a visitor to spend extra time at the Grand Canyon. The overnight tour begins with a visit to the dramatic red rock country of Sedona where your guide will point out some of the scenic highlights and includes a stop for coffee and photos. Then travel to the Navajo Indian Reservation to visit a local trading post with a great selection of traditional and local art. After arriving at the Grand Canyon, tour the East Rim drive for stops at dramatic viewpoints. Then enjoy time in the Grand Canyon Village area for views or a nature walk before checking into your local accommodations. Your morning is free to take an optional helicopter tour or see the Imax Theatre presentation. Enjoy a walk along the rim or take the West Rim tram (seasonal) to other scenic viewpoints. You will return to Phoenix in the evening. Overnight accommodations will be made at either the Yavapai Lodge, Maswik Lodge or Bright Angel Lodge subject to availability.